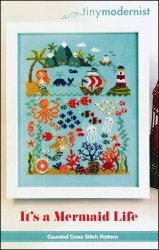 It's A Mermaid Life [H5360] - $9.00 : Yarn Tree, Your wholesale source for cross stitch supplies. Cross stitch pattern from Tiny Modernist. The great big sea is awaiting you! "It's a Mermaid Life," would be an adorable design to stitch for a little girl. Little mermaids are swimming among the sea creatures. Mountains stand tall in the distance, as sailboats set sail for the day. The lighthouse will be your guiding light. Dream big little mermaid. Stitch count 110w x 142h.